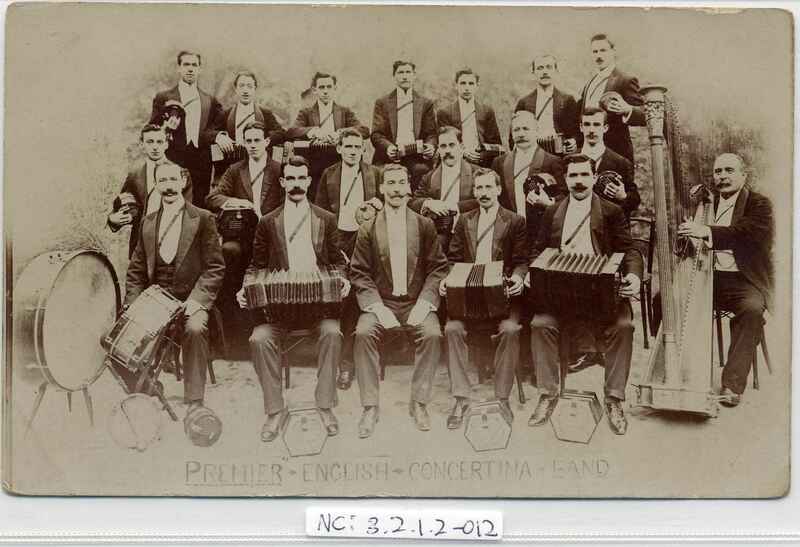 Full Description: A British photo-postcard of "The Premier English Concertina Band", faintly labelled beneath the image of an elegantly-posed group of 19 musicians in white tie, sash and tailcoats. 17 of them hold concertinas, 1 drum, with 4 further concertinas in front on the floor. The front row members hold large bass concertinas, the rest all with Edeophones. This promotional card has a divided rear. Similar copies, with Lachenal and Co promotional messages, at Items NC:3.2.1.2-002 and NC:3.2.1.2-008.